The media continues to use language unevenly when reporting on acts by white supremacists compared with Islamist extremists. In over 200, 000 articles on 11 different attacks, Islamist extremists were labelled terrorists 78.4% of the time, whereas far-right extremists were only identified as terrorists 23.6% of the time. Reporting on the Christchurch shooting is exceptional, for an attack by a white person, in how willing the media was to label the attacker a terrorist. Key figures and spokespeople taking bold and progressive stances on these issues set a precedent that has a notable, and measurable, impact in the media. Why does the media refuse to call white murderers terrorists? Why, instead, are these killers humanised and we, the reader, encouraged to feel for or relate to them? These questions have surfaced time and time again during the increasingly prevalent white-supremacist and far-right attacks of recent years. Both in terms of the language used, and the quantity of coverage, media treatment of differing forms of extremism is skewed. A Muslim can be expected to be immediately labelled a terrorist, whilst the media is hesitant to apply this term to white people. Research by the University of Alabama has shown that, between 2006 and 2015, terror attacks committed by Muslim extremists received 357% more US press coverage than those committed by non-Muslims, despite the fact that majority of domestic extremist killings in this period were linked to right-wing radicalism. On March 15, a white supremacist committed the deadliest act of terrorism in New Zealand’s modern history. A shooter began attacking the Al Noor Mosque before continuing on to the Linwood Islamic Centre. 50 people were killed, and 50 others injured. The first of these attacks was streamed live on Facebook. The media fallout and coverage of this event has been intense. In the two weeks after the attack there were over 200,000 pieces covering the shooting and its aftermath. The Daily Mail and the Mirror described the shooter as “angelic” and a “little blond boy” respectively. Both have been criticised for doing so, but how pervasive is this type of language in the media? Below is a statistical analysis of over 200,000 news items published in the two weeks following the Christchurch attack. These articles come from around 80 different languages. It compares these pieces to ones on recent Islamist extremist attacks and other recent far-right attacks. In particular, there is a focus as to what extent these attacks are linked to terrorism with the language used in them. Over 40% of global coverage has not labelled this attack as an act of terror. This disparity varies across different forms of media. Broadcast media (TV, radio etc.) failed to relate the attack to terrorism far more frequently (51.7%) than any other. One possible explanation for this is broadcast pieces tend to be the shortest (by word count) of all; they cut down stories to a minimum level of information. Given this data is pulled from a set of 3,000,000 sources one might ask whether this disparity is present in what might be called “top-tier” news outlets. These outlets, with larger audiences and more authoritative reputations, are more influential. Filtering down to a select list of 50 top-tier outlets (see below, Appendix 2), this gap is actually amplified: 52.3% of pieces fail to mention terrorism. Between these 50 publications, the attack was mentioned over 4,500 times. Many of these articles were not dedicated to this event and only made passing references to it. As with the brevity of broadcast media, this might be a reason for failure to connect the attack to terrorism. To account for this, we can look at articles that specifically mention the Christchurch attack in their headline: it seems reasonable assume that these articles were directly on the attack. Whilst the gap narrows, it is still very much there. In pieces that mention the attack in their headline, from all sources, almost two fifths (39.8%) did not mention terrorism. From our top-50 source set, pieces mentioning the attack in their headline did not mention terrorism over a third (36.0%) of the time. Obviously, the above means very little if we do not compare it to other acts of extremism. The 2018 Paris knife attack. The 2018 Carcassonne and Trèbes attack. The 2017 Manchester arena attack. The 2017 Parsons Green tube attack. The 2017 New York Truck attack. The 2017 Stockholm truck attack. The 2018 US attempted mail bombs. The 2018 Pittsburgh synagogue attack. The 2018 Charlottesville car attack. The 2018 Toronto van attack. The 2017 Quebec mosque attack. 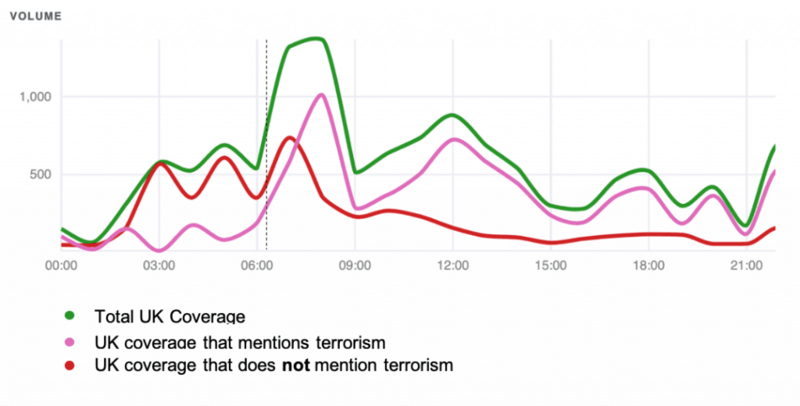 To ensure as fair a comparison as possible, the exact same thing was looked at in each case, namely: the number of articles mentioning the attacker (by name) was compared with those that mentioned the attacker but did not mention terrorism. The first thing that is evident is that reporting on Islamist extremist attacks is quantifiably different to reporting on far-right attacks. The media is, as expected, far more likely to relate these attacks to terrorism. The second thing to notice is that the Christchurch attack is anomalous in how ready the media has been ready to label it terrorism. This is particular notable when we compare it to last year’s shooting in synagogue in Pittsburgh. Evidently there was something different about the reaction to the Christchurch attack than other far-right extremist attacks. It seems reasonable to contrast the Pittsburgh and Christchurch attacks. Both attackers were on the far right and white supremacists. Both attackers were associated with alt-right blogs. Both events were shootings. Both attacked a religious minority in their place of worship. However, despite the similarities there is evidently an incredible difference in the way in which these two events were reported. President Donald Trump condemned the Pittsburgh attack as a “wicked act of mass murder”. He did not, however, call it terrorism. 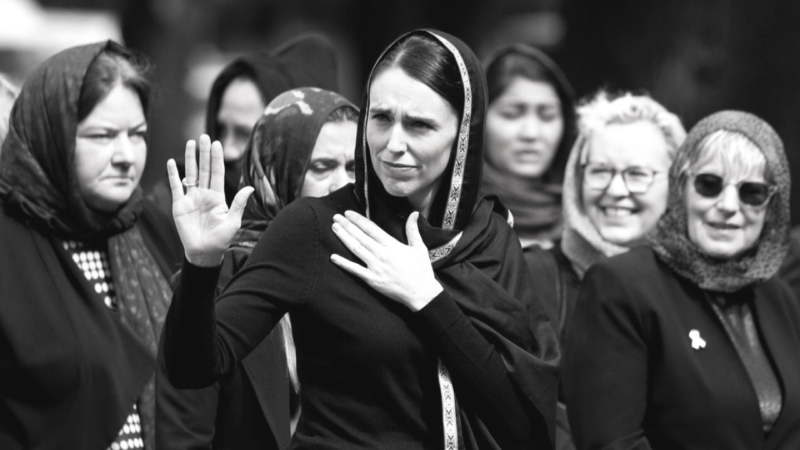 Prime Minister Jacinda Ardern, on the other hand, called the Christchurch attack an act of terror within six hours of it starting. It seems that Arden’s willingness to label the Christchurch shooting as terrorist has led the media’s narrative. At no point after the pink line passes the red line does the red line proceed to catch up. The example set by Ardern immediately filtered into the media. Before her comments few publications labelled the attack terrorism; after them, few did not. Ardern’s voice was powerful in setting the tone for the response to the attack. Beyond this, in the wake of the Christchurch attack, the way in which the Pittsburgh shooting is talked about has shifted. As a result of comparisons between the Christchurch and the Pittsburgh shootings, labelling of the events in Christchurch as terrorist have had a reciprocal effect in how the Pittsburgh shooting is seen. The graph below shows coverage of the Pittsburgh shooting the week it happened as a whole (the blue line), compared to coverage which made no relation between it and terrorism (the orange line). Compare this to recent coverage. Below is a graph of coverage of the Pittsburgh shooting from the week of the Christchurch shooting. Notice the huge reduction in coverage that makes no mention of terrorism. Therefore, the impact of Ardern’s words have gone further than just influencing how the Christchurch shooting is spoken about. They may have been a step, even if only a small one, in altering the media’s representation of terrorism as a whole. The belief that the media treats terrorism unequally depending on the background of the attacker is grounded in the numbers. In the attacks studied, articles on Islamist extremism did not mention terrorism one quarter of the time. Articles on far-right attackers did not mention terrorism three quarters of the time. This is an issue that will apply to media in all topics, not simply terrorism. No media outlet can be taken as an impartial source, each weave their own preconceptions and biases into narratives regardless of the topic. The Christchurch shooting is actually exceptional in how willing the media were to label the shooter a terrorist. The reasons for this are not entirely clear but seems to have been added to by Ardern’s bold and immediate stance on the attack. If this is the case, it shows that influential figures may have the ability to shift the narrative around events and topics. Spokespeople’s language filters into the media and, likely, into public dialogue. Want to know more? Explore Signal’s unparalleled media insights. At the time of writing (28.03.2019) there have been 231,289. There have been 92,689 pieces which use none of the following words at any point: “Terrorism”, “Terrorist” or “Terror”.